The char from the grill, the slightly bitter radicchio sweetened up by a dressing of honey and orange, and then the burst of fresh grapes to brighten up the smokiness. Make this for your next dinner party, make it tonight, heck make it for breakfast—just make it! Add the yogurt, mayonnaise, orange juice, honey, vinegar, and salt to a medium bowl. Whisk together until well blended; then whisk in the chives. Heat a gas or charcoal grill (or plan to use a grill pan). Use a pastry brush to brush the oil over all surfaces of the romaine, radicchio, and onion wedges; then sprinkle the salt evenly over them. If not using a grill, heat a grill pan over high heat. 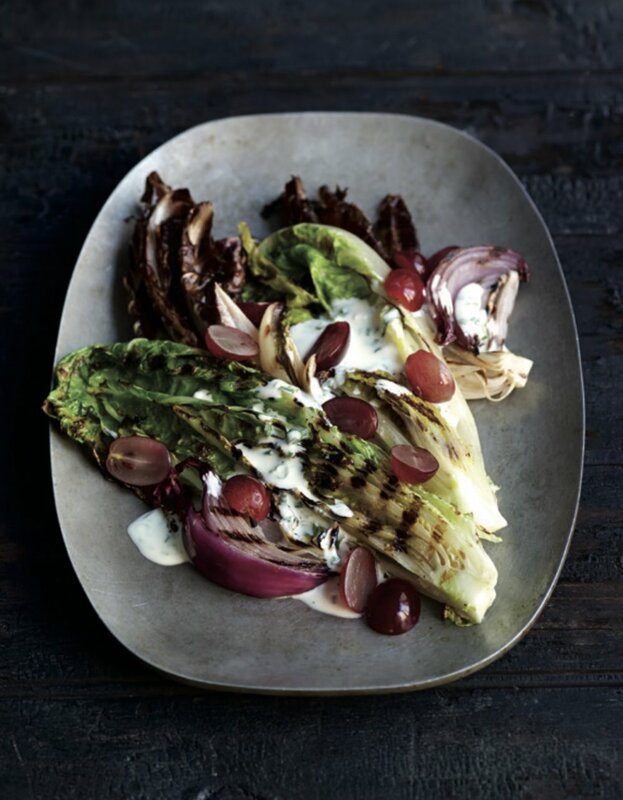 Working in batches if necessary, arrange the romaine, radicchio, and onions on the hot grill or grill pan. Cook until all pieces are slightly wilted and charred on all sides—1 to 2 minutes per side for the romaine and radicchio, 2 to 4 minutes per side for the onions. To serve, divide the romaine, radicchio, and onions among 4 plates. Ladle one-quarter of the dressing (about ¼ cup) over each serving. Divide the grapes over the tops. When the veggies are done, leave the grill or grill pan on and cook up a small pork tenderloin. Cut, place next to the veggies and top everything with the dressing. All delicious, easy-to-make, moist and flavorful breads, thanks to the fruits and veggies they incorporate. So let’s keep the Veggie Bread Train in business! It's time to talk about Acorn Squash Bread! Prepared similarly to pumpkin bread, acorn squash bread uses the delicacy and sweetness of squash--along with spices like cinnamon and nutmeg--to make for a savory, but slightly sugary bread. This bread is perfect for your Christmas Day table or a cozy treat for Christmas morning when you're sitting around the kitchen with out-of-town relatives over cups of coffee. Just bake halves of acorns squash, scoop out the sweet flesh, mix with some pantry staples, and you’ve got an extremely addictive quick bread! And to take it one step further, I drizzle mine with a little cider vanilla glaze--yummm. Then sprinkle it with some granola for a sticky sweet and delightfully crunchy topping, and you've got a recipe your relatives won't stop asking you for! Preheat the oven to 425°F. Cut the squash in half lengthwise. 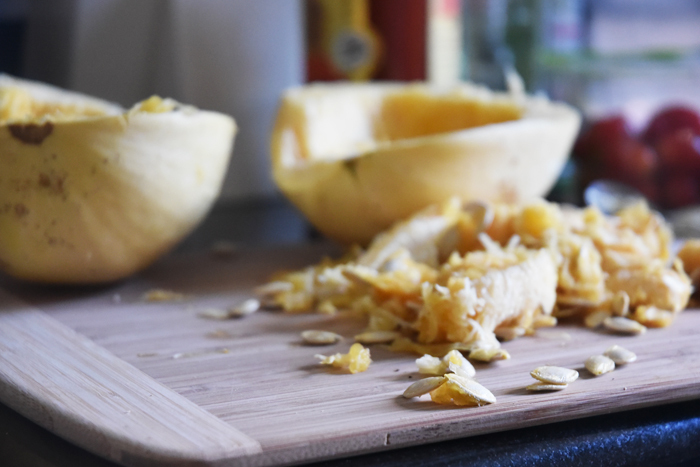 Use a soupspoon to scoop out the seeds and discard them. Arrange the squash cut-side-up on a rimmed baking sheet and rub its flesh with the olive oil and ½ teaspoon of the salt. Bake the squash until the flesh is fork tender—about 45 minutes. Scoop out the flesh of the squash, add it to the bowl of a food processor, and puree until smooth (this should give you about 1 cup of puree). Then reduce the oven temperature to 350°F and grease a 9 X 5-inch bread loaf pan. In a large bowl, whisk together the flour, cinnamon, baking soda, baking powder, nutmeg, and cloves. In a second large bowl, whisk together the squash puree, light brown sugar, canola oil, granulated sugar, ⅓ cup of the cider, eggs, vanilla, and remaining ½ teaspoon of salt. Fold the wet mixture into the dry mixture until just combined. Then pour the batter into the loaf pan and bake until the edges of the bread are brown and a toothpick inserted into its center comes out clean—about 60-65 minutes. Let the bread cool in the pan for 15 minutes, then remove it from the pan and cool completely. Next, whisk together the confectioner’s sugar and the remaining 1 tablespoon of cider until a smooth glaze forms. Drizzle over the cooled bread, sprinkle with granola, and serve. To make muffins: Lower the oven temperature to 350 F after the squash is roasted. Make the batter and glaze as directed above. Divide the batter into 9 cups of a lined or greased muffin tin and bake until the edges are brown and a toothpick inserted in the center comes out clean, about 18-20 minutes. Let cool in the pan for 15 minutes, then remove muffins from the pan to cool completely. Drizzle cooled muffins with glaze, sprinkle with granola, and serve. I’m a big fan of desserts with apples--if I’m at a restaurant and it has some sort of apple-licious dessert on the menu, you can put good money on the fact that it will soon be in my belly. With winter in full swing, there have been a plethora of apple pie-inspired desserts at all my local spots and that means I have definitely been having my doctor-recommended apple-a-day. Some chefs will tell you that presentation is everything. Well that’s not exactly true, though yes, we eat with our eyes first, it’s really all about the taste. I’ve been lucky enough to have spent 11 Valentine's Days with my husband. Sometimes the older you get--or the longer you've been with someone--you start to think things like Valentine’s Day are silly. 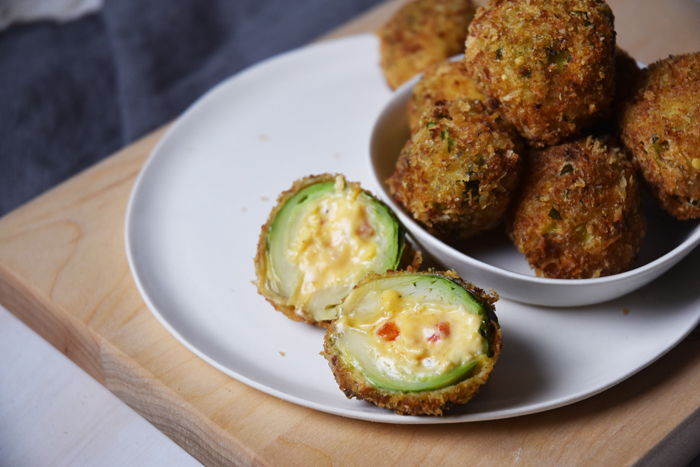 Super Bowl Sunday is just around the corner and this means you're about to be eating all the Super Bowl snacks your little heart could desire. It's a day to sit around, watch TV, crack open a beer, and forget about those New Year's resolutions--while enjoying all the cheesy, fried, Buffalo-flavored things you can imagine. 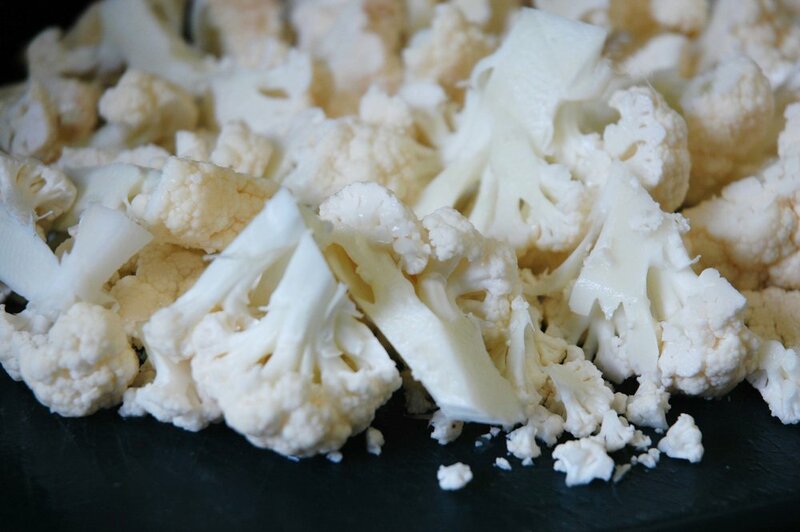 Cauliflower is definitely having its moment in the sun. One of the reasons it’s so popular is that everyone is churning out cauliflower crust pizzas--and loving how tasty an all-veggie crust can be! Since I’m normally coming up with new and hopefully inventive recipes, there are definitely times in my kitchen where things don’t turn out quite as I expected. And then there are the times that you put a pea on uncooked pasta, throw it in boiling water and instead of it falling apart, the pea and pasta fuse together for one insanely cute dish. The bottom line is that making your own soup saves you a ton of money, plus you can get some great nutrition in a filling, flavorful and many times low-cal little package. Have I sold you yet??? Chicken noodle soup is great and all, but if the stock you're using isn’t first class, well, the whole thing can end up tasting...just okay. 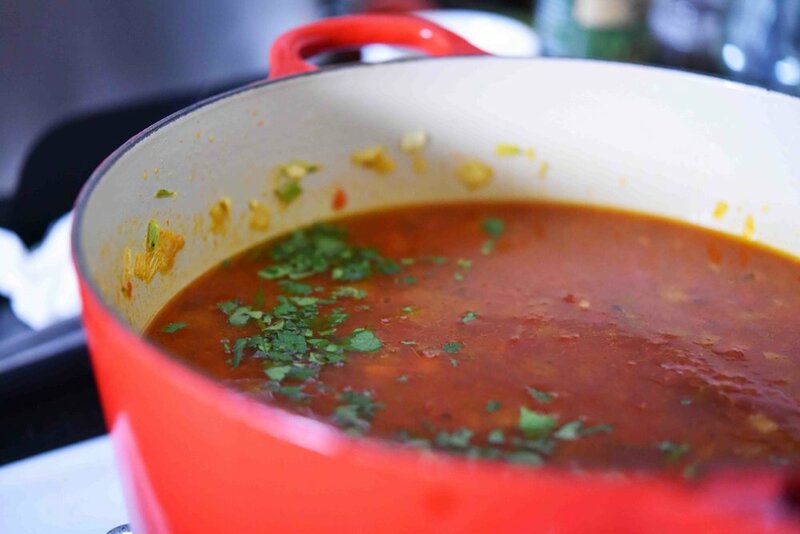 So for this recipe, I’m using veggies that will infuse the broth with a spicy, smoky flavor. A flavor that will wake up your taste buds. Roasted red peppers, fire roasted tomatoes, and sriracha—all things you can find in any grocery store these days! These ingredients elevate what was once a basic soup to anything but. 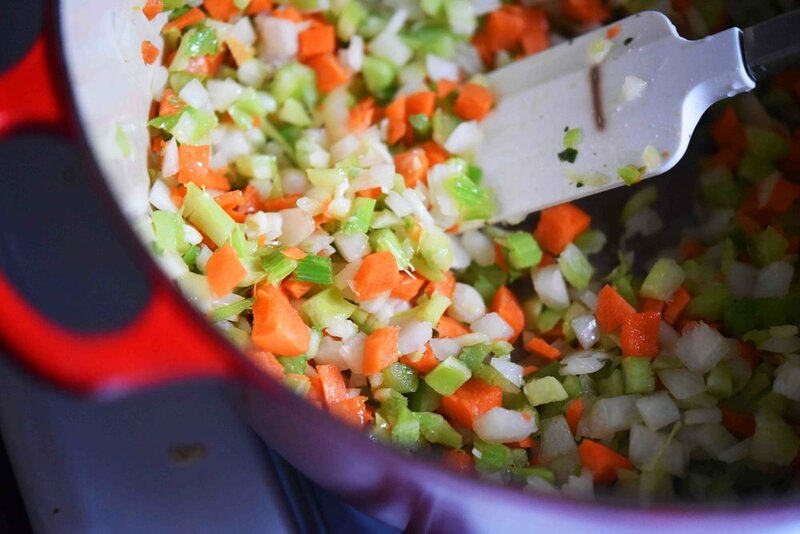 Heat the oil in a large pot over medium heat, then add the celery, onions, carrots, garlic and 1 teaspoon of the salt. Cook this mixture until it is soft and fragrant—about 7 minutes. While the veggies cook, drain the roasted red peppers, then prepare by pureeing them in a food processor or blender, or finely chopping by hand. To the pot with the veggies, add the stock, pureed roasted peppers, tomatoes, sriracha (use 1 to 2 tablespoons, depending on how spicy you like things), and remaining 1 teaspoon of salt. Bring this mixture to a simmer, then cook to allow the flavors to combine—about 5 minutes. Add the egg noodles and cook until they are a couple of minutes short of al dente—about 5 minutes. Add the cooked chicken, lime juice, and parsley, then cook until the chicken is warmed through—about 3 to 5 minutes. Taste the soup and add salt if needed. To serve, top with the additional parsley along with the avocado. Enjoy with grilled bread if desired. As a kid--and still, as an adult--I was (am!) obsessed with mac and cheese. But my kid-self wanted nothing to do with any kind of homemade mac and cheese sporting a bubbling crust. No, if it didn’t come out of a box, I wouldn’t go near it. It’s been a couple of years, but there are still a lot of kids out there just like me (and maybe some adults, too). So how do you get your kids to eat a homemade mac and cheese that’s also packed with veggies? You make it look and taste as much like the original as possible! 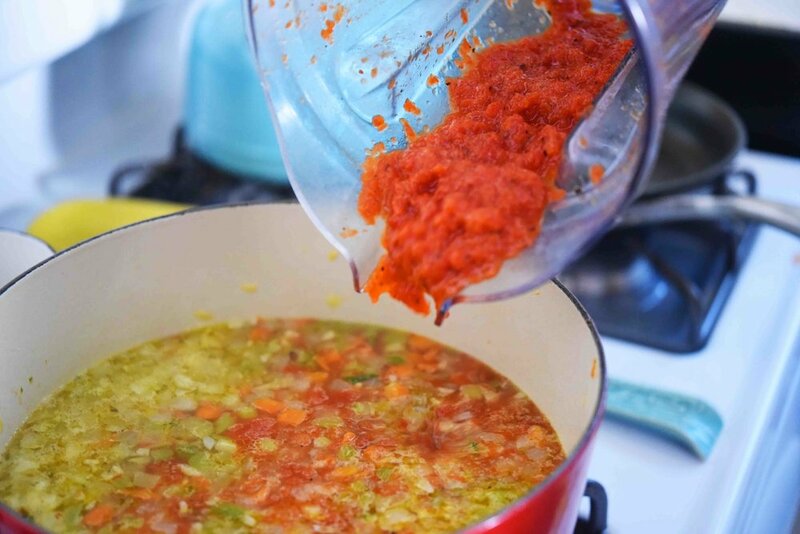 The base of this sauce is pureed veggies. There's no butter and no milk. But there are so many hidden veggies inside, it will make your head spin. It’s time to lose the box (...at least, sometimes)! Place a large pot of salted water over high heat for cooking the macaroni. Heat the oil in a large saucepan set over medium heat. Add the onion and garlic, and sauté until tender—5 to 7 minutes. Stir in the cauliflower, sweet potato, vegetable stock, and the 1¼ teaspoon salt. Bring this mixture to a boil, and then reduce the heat to a simmer. Cook covered, stirring occasionally, until the vegetables are tender—about 20 minutes. This should give you about ¼ cup liquid along with the veggies. Place the veggie mixture in a blender and process it until it is completely smooth. Add more stock or water if there is not enough liquid to blend easily. Then transfer the mixture back to the saucepan over low heat. Add the cheddar cheese, American cheese, and remaining ½ teaspoon salt; stir until the cheese melts (depending on the saltiness of your stock and cheese you may not need this extra ½ teaspoon of salt). Add more stock if your mixture is too thick or if it thickens over time. When the water boils, add the macaroni and cook according to the package directions. When done, drain and transfer the macaroni to the saucepan with the veggie and cheese mixture. Toss to combine and serve. You can use any combination of cheese that you like—cheddar, parmesan, fontina or provolone— though I do like to include a little American or Velveeta in my mix, as it gives the cheese sauce the right consistency. This version is on the simple side; for a flavor that makes a bigger impact, I suggest stirring in some salsa or adding sautéed peppers to the mix. 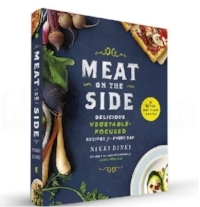 If you have read my vegetable-focused cookbook, Meat on the Side, it was probably shocking to learn on page 108 that...I don’t like carrots. Because as much as I’m a huge veggie fan, I have to say that not all veggies are created equal. In my mind, carrots just fall low on the list. But that doesn’t mean I don't eat them. I know that the more I eat them, the more I’ll get used to them and develop a taste for them. In other words, I'll actually learn to like them. So when thinking about a carrot side dish, I knew I wanted it to be delicious to carrot-lovers, carrot-likers, and carrot-tolerators alike. And I figured the best way to do this was to invite some of my favorite things like brown butter and garlic to party. In the end I seriously LOVED these carrots--like shockingly LOVED these carrots. Preheat the oven to 425°F. Place the carrots in a single layer on a baking sheet and toss them with the olive oil, salt, and pepper. Roast the carrots until they are tender and browned in spots—about 30 minutes. Please note that if your carrots are thicker they will take longer to cook. Meanwhile, toast the bread until it is dried out and golden brown. Then transfer the bread to a food processor and pulse until breadcrumbs form. Set these aside for later. Next, in a large sauté pan over medium heat, add the butter and swirl the pan until the butter stops foaming and bubbling and you see brown specks on the bottom of the pan—about 5 minutes. Remove the butter from the heat and allow it to cool slightly, then add the garlic followed by the carrots, and toss these ingredients together. Transfer the carrots to a plate and top with the breadcrumbs and parsley. A friend of mine wrote an article about having a ton of zucchini in her family's garden when she was growing up. So much, in fact, that her family resorted to dressing their excess of squashes in "outfits" and leaving them on a "lucky" neighbor's doorstep (read more). I suppose that is one (uh...ahem) effective way to deal with an excess of zucchini in your garden. However, may I gently suggest another? To bring another vegetable into the conversation, cucumbers are similar to zucchini. For instance, both vegetables are delicious raw as well as cooked. With this in mind, I'd like to point out that anything cucumbers can do, zucchinis can do also! So instead of making the same old cucumber salad (don't get me wrong, those cucumber salads can be delicious! ), I decided to bring our mutual friend, Mr. Zucchini, to the pickling party. The best think about this Cucumber Zucchini Salad is that it takes only a few minutes to make and only a few more to marinade. In the end, you have a light, refreshing salad with crunchy cucumbers and zucchini that are seriously a match made in heaven. And as a bonus, it’s like -20 calories (okay, not really, but I'm sure it's close)! Using a mandoline or a sharp knife, cut the cucumber and zucchini into very thinly sliced rounds. When you are finished slicing, you should have about 2 cups of cucumber and 1½ cups of zucchini. In a medium size bowl, toss the cucumber and zucchini slices with the onion and salt, allow this mixture to sit for 30 minutes, then transfer it to a colander to drain off the excess liquid. Return the veggie mixture to the bowl and set aside. Next, combine the vinegar, sugar, and red pepper flakes, whisking or stirring until the sugar has dissolved. Then pour this mixture over the veggie mixture, tossing the veggies to coat them evenly. Chill the salad for at least 30 minutes in the refrigerator. Be sure to drain off any excess liquid once again, before serving. It's been my goal for awhile now to make a bang-up version of a veggie burger. But every time I really thought about it, I was super intimidated. I mean, all of those weird ingredients, lots of chopping, and then the fear that after the first bite, the whole thing might just fall apart. So instead of tackling this daunting task head-on, I've avoided it like the plague. I just told myself that someday I'd make a better—no, a perfect—veggie burger. More perfect than any other one out there. And so when the time came for me to face my fear, I came up with something that makes me wonder what I was so afraid of in the first place. My Ultimate Veggie Burgers have no weird ingredients, are super dense (for that BIG bite experience! ), and look better than some of the best beef patties you've ever laid eyes on! Like all amazing things we can't have right away, the reward is SO worth the wait! Preheat the oven to 400°F. Spread the lentils and mushrooms on a parchment-lined or lightly sprayed baking sheet and roast them until the lentils are dry and crisp on the outside and the mushrooms are dry and shrunken to half their original size—25 minutes. Use a wooden spoon to move the mushrooms to the side, then spread the cooked rice in the open space. Return the pan to the oven and cook until the rice is lightly toasted in places and the lentils are very dry—15 minutes. While the beans, mushrooms, and rice are cooking, place the walnuts in the bowl of a food processor and pulse them until they are coarsely ground. When the lentils, mushrooms, and rice have finished roasting, add them to the food processor and pulse until well-combined, but not completely smooth. Then add the flour, barbeque sauce, egg, salt, garlic powder, rosemary, and paprika and pulse just until all ingredients are combined. Next, form the mixture into six even patties by hand, each about 3 to 4 inches in diameter and ¾-inches thick. Then heat the oil in a large skillet over medium-high heat. Add the patties and cook them until they are well-browned and crisp—about 3 to 4 minutes per side. ¾ cup dried lentils should yield the 1½ cups cooked lentils you need in this recipe. Also, ½ cup uncooked brown rice should yield the 1½ cups cooked rice needed. If you prefer to bake the patties rather than sautéing them, place them on a lightly-sprayed unlined tray and bake them at 400°F until they are golden brown and crispy on the outside, flipping halfway through—about 20 minutes. You can omit the flour for a gluten-free patty. The patties will be slightly less stable, but still very good. To prepare from frozen, bake patties at 400°F for 13 to15 minutes. This might be my favorite souped-up mac and cheese recipe. And it’s also the simplest! 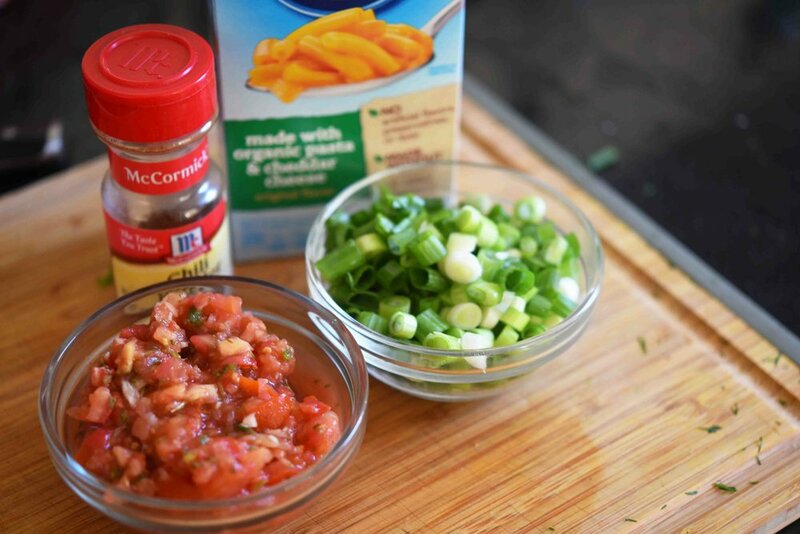 All you need to do is add some chili powder and scallions! Then top it with some tangy salsa! 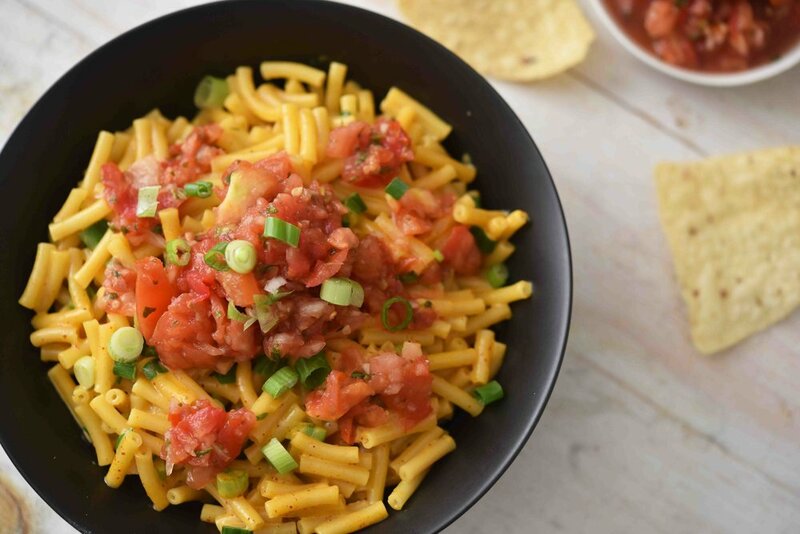 It’s so easy, but mac and cheese and salsa just really love each other. And my belly can't help getting in on this Lovefest, too! Place a medium pot of salted water over high heat for cooking the macaroni. When the water boils, add the macaroni and cook according to the package directions; drain when finished. 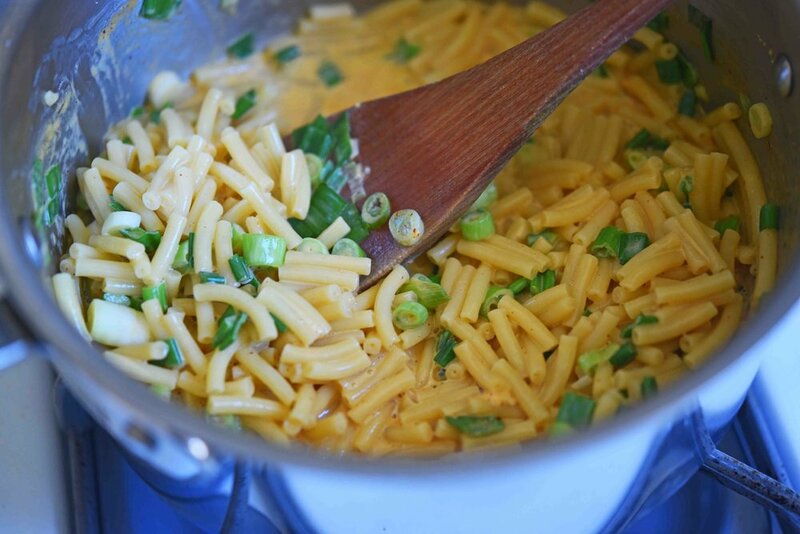 Return the pasta to the same pot over medium heat, adding the scallions, milk, butter, cheese powder packet, and chili powder, then stir all ingredients to combine. To serve, top with the salsa and reserved scallions. A sweet potato casserole is a good thing. The sweet potatoes take on an extra sweetness, complemented by all of those warm fall spices. Top that goodness with marshmallows, and you have a comforting side that’s always welcome on my Thanksgiving table. But as much as I like a good sweet potato casserole, they always seem to be missing something. I've noticed that there's usually no texture--just a lot of mush. And as much as the sweetness is nice, it gets a little too sweet after a couple bites. So let’s make a better sweet potato casserole! One with cinnamon spiced apples to give it a little bite and a slightly sour relief from all that sweet! Mix that in with the usual suspect and a couple of eggs for a fluffy yet firm dish. Finally, top it all with a simple (but simply tasty!) cranberry sauce and some crunchy granola and you have a mouthwatering side dish that tastes like your traditional holiday staple--just better! It's balanced, textured, and so completely addicting. I like a classic Thanksgiving Day sweet potato casserole as much as the next person, but this sweet potato casserole will make you fall deeply, madly, in LOVE! In a medium pot, add the cranberries, sugar, orange zest, orange juice, and salt. Cover the pot to avoid splattering and cook over medium heat until the mixture reaches a jam-like consistency (keeping in mind that it will thicken as it cools)--about 25 minutes. Preheat the oven to 400°F. Peel the sweet potatoes and cut them into 1-inch cubes. Add the sweet potatoes to a baking sheet, toss them with the oil and ½ teaspoon salt, then cook them until they are fork tender—about 45 minutes. You might also choose to leave the sweet potatoes whole and unpeeled, cooking them until they are fork tender—50-60 minutes. While the sweet potatoes cook, melt the butter in a large saucepan over medium heat until it is browned—about 5 minutes. Add the apples, cinnamon, and nutmeg and cook this mixture until the apples are tender but not mushy—about 2-3 minutes. Once they are done cooking, remove the sweet potatoes from the oven and turn it down to 375°F (if you left the sweet potatoes whole and unpeeled, peel them once they are cool enough to handle). Add the sweet potatoes to a large bowl and mash them with a fork or potato masher, then mix in the milk, brown sugar and eggs and stir until well combined. Next, stir in the apple mixture along with the remaining 1 teaspoon of salt. Add the apple and potato mixture to a greased 8½ by 11-inch casserole dish and bake until it is firm and slightly darker in color—about 25-30 minutes. Then remove the casserole from the oven and top it with the Cranberry Sauce, marshmallows, and granola. Return it to the oven and cook it until the marshmallows are brown and crispy and the cranberry sauce is dark red—10 minutes more. REHEAT + TOP - To make ahead, prepare the casserole as indicated in the recipe, then bake it for 25-30 minutes at 375°F; however, do not top it with the Cranberry Sauce, marshmallows, and granola. Instead, refrigerate it and on Thanksgiving Day, remove it from the refrigerator and let the casserole sit until it reaches room temperature. Then reheat it in an oven preheated to 375°F for about 10 minutes. Remove the casserole from the oven and top it with the Cranberry Sauce, marshmallows, and granola. Return it to the oven and cook it until the marshmallows are brown and crispy and the cranberry sauce is dark red—10 minutes more. ASSEMBLE + BAKE LATER - Or you can leave it raw, so that you only follow Steps 1 through 3 above; refrigerate it until Thanksgiving. On Thanksgiving, complete Step 4 to bake and prepare the casserole. You may need to bake it for an extra 5 minutes due to the fact that it will be coming out of the cold fridge. TIMELINE - You can make the casserole up to 3 days in advance; you can make the cranberry sauce up to 5 days in advance. So great being on The Wendy Williams Show today! Check out the clip--and the recipe!--for my Red Cabbage + Raspberry Grilled Cheese. Heat the oil in a large skillet over medium heat. Stir in the cabbage and salt and cook until tender but not mushy, —3 to 4 minutes. Stir in the jam and vinegar and cook until most of the liquid has evaporated and the cabbage is completely tender, —2 to 3 minutes more. Remove the skillet from the heat. Heat a second large skillet over medium-low heat. Butter 1 side of each slice of bread. Place 2 pieces of bread, butter- side- down, on a plate. Top each with 3 alternating layers, : first of cheese, then cabbage, and then the rest of the cheese, dividing them equally, and then finish off with another slice of bread, butter- side- up. Place the sandwiches in the skillet and cook them until browned on the bottom, —3 to 5 minutes. Then fFlip them over and cook until the other side is has browned and the cheese is has melted, —3 to 5 minutes more, gently pressing the sandwiches as they cook. Cut in half and serve. You can really customize this sandwich: just use what you have in the pantry. Any sliced bread works fine, you can substitute any jam flavor that you like, and instead of champagne vinegar feel free to use red wine vinegar, white wine vinegar, or apple cider vinegar. Purple cabbage is also known as red cabbage and may be labeled that way. I can usually find purple cabbage freshly shredded by the store in my produce section. You can also use green cabbage for a similar taste but a slightly less exciting color. Because of the sweetness of the cabbage and the fact that it’s a grilled cheese, this sandwich should be a hit! Not convinced? Use half that amount of cabbage mixture for super- picky eaters; the cheese will melt all around it, mostly concealing our little secret. I didn't just get the nickname “Picky Nikki” for no reason at all, no, I gave my mother so many reasons to call me “Picky” that I'm almost surprised that she ever called me anything else. When I talk about my childhood I sometimes generalize and say that I ate no vegetables.